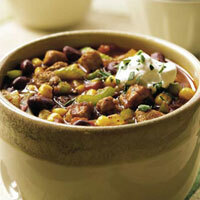 This incredible chili takes only 20 minutes to make. The degree of heat is up to you. Add more chili powder or fresh chile peppers as you like. Mexican Pork and Bean ChiliHeat oil in a large nonstick skillet over high heat. Set aside 2 tablespoons of the sliced onion for garnish. Add the meat, celery, green pepper, and remaining onion to the skillet. Cook 5 minutes, tossing to brown meat on all sides. Add beans, tomatoes, corn, chili powder, and cumin seed. Lower heat to medium and simmer 15 minutes. Add salt and pepper to taste. Serve chili in large bowls. Place the sour cream, cilantro, and reserved onion into small bowls and pass with the chili. Shredded Lettuce SaladPlace salad in a bowl and toss with dressing. Variation: Frozen diced onion and green pepper can be substituted for fresh to save time. Variation: White cannellini beans can be used instead of red beans. They will give a softer, lighter texture to the dish. Serving Suggestion: Serve this chili with bowls of sour cream, chopped onion, and chopped fresh cilantro as garnishes, along with some rice. Serving Suggestion: Chili freezes well. If you have time, double the recipe and freeze half for another quick dinner.